There have been a few discussions over on Lead Adventurer’s Forum about building gaming tables. Much as I would love to have a dedicated table, there isn’t a cat in hell’s chance of that happening, so I need something portable, collapsible and because it's me, cheap. I went with 9mm MDF – reasonably light, and inexpensive. The sheet cost £15, and B&Q cut it into quarters more me on their big saw. I could have cut it myself, but to be honest how am I going to get a 8’x4’ sheet home intact in a Ford Ka! So, I’m left with four pieces of MDF, each 4’x2’, that are reasonably easy to handle and store and also drop nicely onto my dining table to make a 6’x4’ surface. 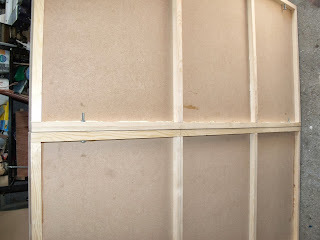 Now, MDF will warp, especially when you lean it against the wall to store it. Sheet material in easy-to-handle bits. So, to prevent this, I added a timber framework. I bought several lengths of 25mm square PSE (planed square edge) timber. I took my time and picked out a selection that were straight, had nice clean grain and were as knot-free as possible. Despite this, even with sharp tools it spelched like hell when it was cut and drilled - horrible stuff! I cut the pieces to length, and added them to the sheets. Two long pieces, and then once these had dried, four shorter cross members. The timber was glued to the MDF with Gorilla Glue and clamped. I reinforced the joints with brads (probably unnecessarily), toenailing them in. The pencil mark is a guide. Nail 'em up, I say! The cross members were fixed to the long pieces with screws. I used these drywall screws, because the application doesn’t need to be over-sturdy, they’re nice and thin (and so less likely to split the end grain), I had about 500 of them lying around and I’m too tight-fisted to buy anything else! The final step was to drill a set of holes into the long cross members. These were carefully measured and positioned, so they line up neatly. This allows me to put a small bolt into place to hold all three pieces together once they’re in situ. This is probably overkill if I use the sections on my dining table, but if I’m using (say) a set of trestles or sawhorses, it might be very helpful. M6 Coach bolts do the job! 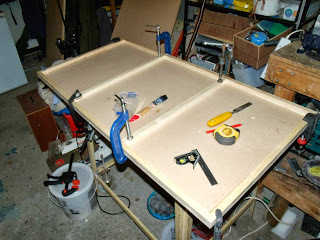 Just to prove it lines up, here's a shot of the working surface with the bolts in place. 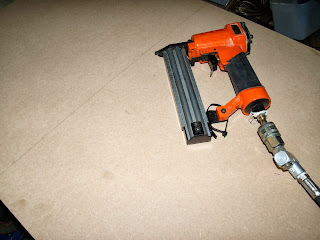 Total cost, under £28, and it can all be done with hand tools. Power tools make it quicker and easier but aren’t actually a requirement here. The work took about four hours in total, in four short bursts of an hour or so each. As far as it goes, this is the end of the "build" as such. I'm not going to bother colouring the surface or adding any detail. No matter what I do in that way it isn't going to be universally applicable, and in the interest of "future proofing" the project, it's isn't worth trying. I can make up a playing surface using felt, card or even fleece blanket in suitable colours for different environments, and store these separately. It's easier (for me at least) just to have a flat surface I can move and store easily, and keep the terrain and environment as add-ons. Of course if you wanted, a coat of suitable paint would be an ideal starting point. 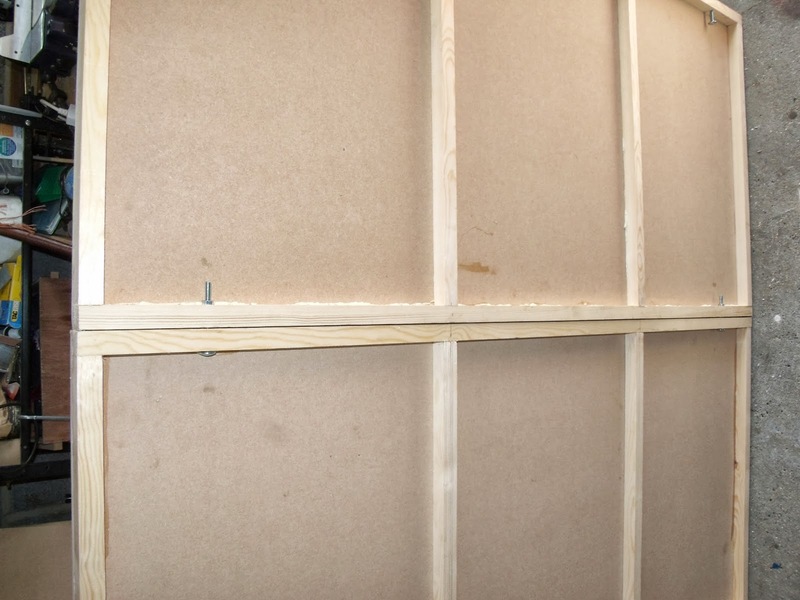 Just remember to prime your MDF with PVA first, unless you have a bottomless paint pot! 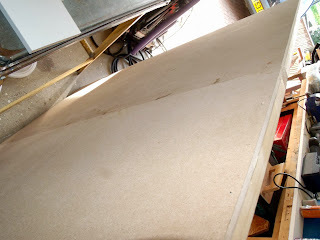 I suggest sealing the MDF with an oil-based polyurethane, just to protect it from the random cup of coffee or soda getting spilled on it. 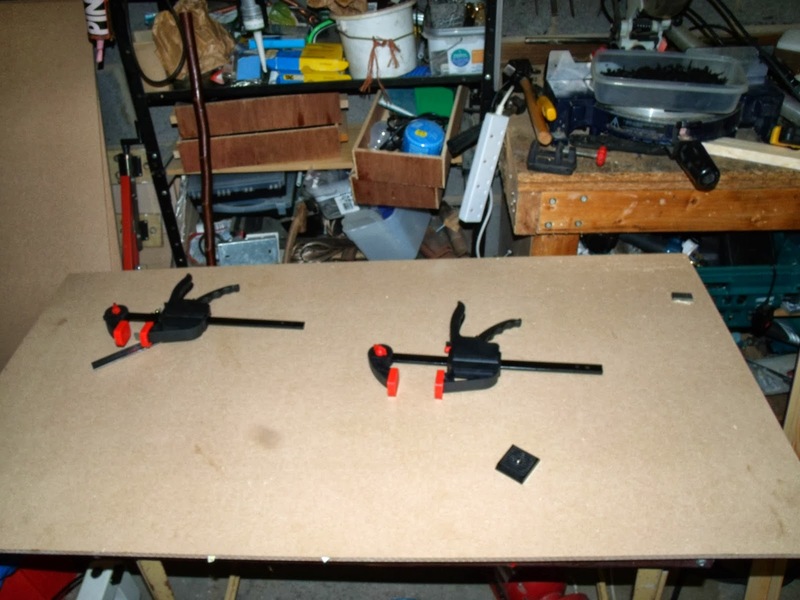 If you want to stretch it across sawhorses, a better method than bolting together would be to use 2x4s (or 2x6s) as supports. 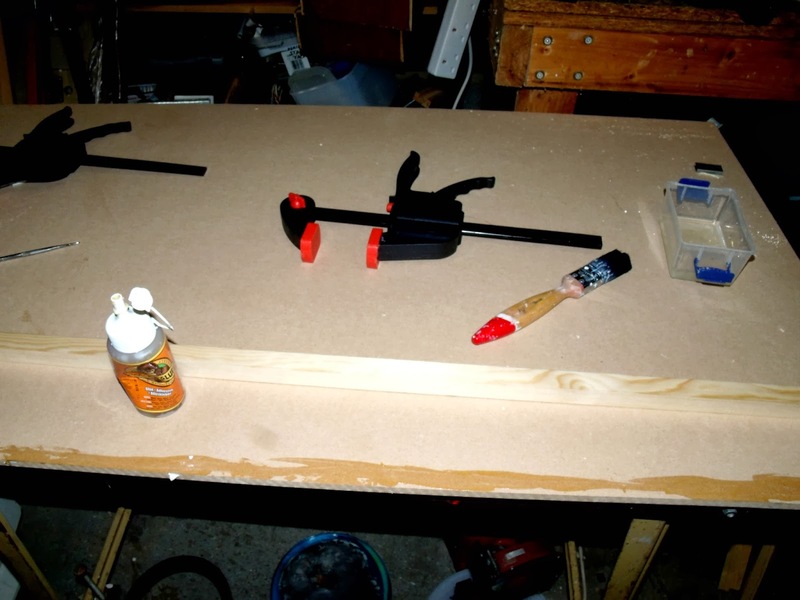 Get them slightly longer than your expected table length and put notches in them that will match up with the frames. 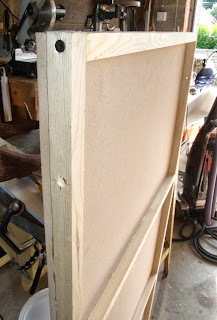 This will secure the frames into the supports so they don't slide easily. 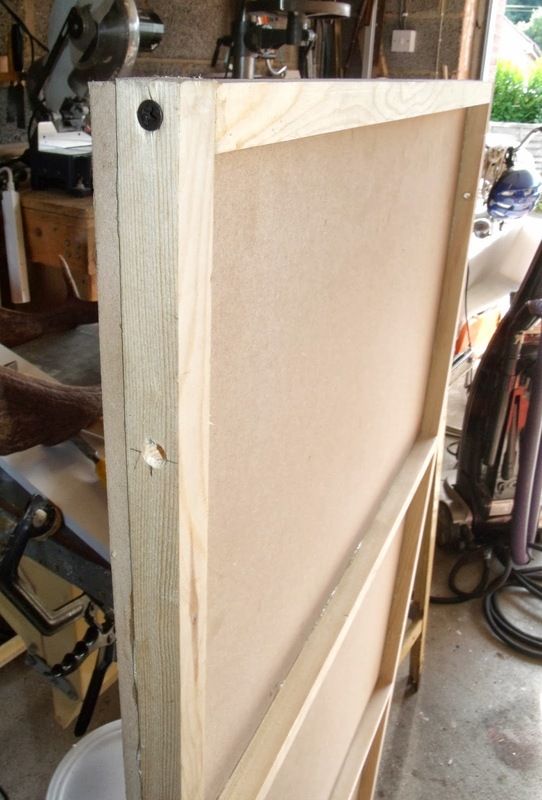 If your sawhorses are like mine and have notches to fit 2x lumber, then you can put small blocks on the underside of the MDF to line up next to where the supports will cross. 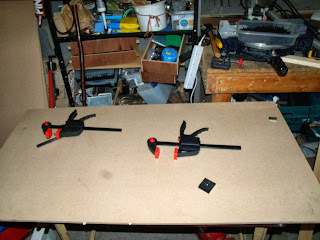 This will prevent the tabletops from sliding across the supports as well as down the length of them. It's a little more work in advance but a lot easier to set up once it's done. 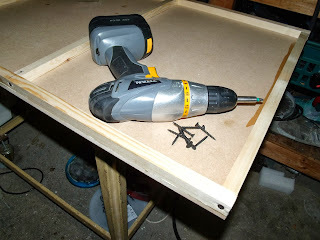 For that matter, you could make a simple slot-together box frame from 2x4s, fitted as above, with felt or foam glued to the bottom of the boards to protect the dining room table top. Set that upon the table and drop the game surface into place on top, and voila.